The focus on Illinois issues upfront sorta interesting. Geez Ray, there's nothing wrong with being a character in Chicagoland. Our history full of them, Royko for starters; but just about everyone brands themselves in some Chicago-larger-than-life sort of way. There's money in it too (and that's not bad, we all gotta live). But admirer Cicero's Larry Dominick? Ray, c'mon. You gotta explain that one to us. Here’s a bio on Conway. Interesting guy…. AG Holder makes the top ten this year. Picture at left is Holder with now convicted Illinois Gov Rod Blagojevich announcing Holder’s hiring to prove Rosemont Illnois was not a mobbed-up community, and indeed worthy of an Illinois Casino license. The b-girls and bookies on Mannheim Road were tickled to hear his selection I’m sure. Today’s Duckworth’s last day to file. Cal Skinner found she wasn’t first in line to file:McHenry County Blog | Tammy Duckworth Doesn’t File on First Day and wonders why. Terrible loss and one that would harm the eventual revitalization of Lawndale. From an interview with John Corry over at the bulldog. The opposition, having suffered from years of harassment at Mr. Putin’s hands, has not yet succeeded in taking advantage of today’s unstable situation. But the recent outburst of public protest has flummoxed Mr. Putin, as he finds that his authoritarian government lacks the pressure valves that allow liberal democracies to anticipate and alleviate expressions of discontent. Mr. Putin can no longer take his supremacy for granted. It is not yet a revolutionary situation. After all, Mr. Putin, like Mr. Yeltsin before him, can count on the money and pork-barrel politics needed to win the presidency next year; and he has no qualms about letting the security agencies use force. But Russians, having sleepwalked away from Communism, are awakening to the idea that if they want democracy and social justice, they need to engage in active struggle. Quiescent 20 years ago during Soviet Communism’s final days, they may at last be about to stand up for their rights. India West covers Krishamoorthi at a San Francisco fund raiser, and notes this stat about Illinois’s 8th district. Illinois’ 8th congressional region underwent redistricting earlier this year. Krishnamoorthi believes he has benefited from that exercise: The new district’s population has the highest concentration of Indian Americans – almost 10 percent – of any congressional district in the nation. Alderman Matt O'Shea, who represents the 19th Ward, announced his intention to keep the borders intact. The problem is, given the demographic realities, I am not sure how he intends to accomplish it. The article points out that, during the last redrawing, the residents were successful in keeping the ward intact. What the article doesn't mention is that, at the time, Chicago gained population. Given how much the population dropped, especially in the South Side, the status quo will be harder to justify. As I discussed in the previous post on the redrawing, the African-American Caucus is desperate to keep its numbers intact. They're going to try to grab as much territory as they can possibly get. On the other hand, Ald. O'Shea is a loyal member of the Old Guard with considerable political experience.19th Ward community organizations have numbers and resources few community organizations in the adjacent wards can match. The sheer number of municipal and union employees in the ward is nothing to sneeze at, either. Even if the 19th Ward residents don't get their way, they will put up one hell of a fight. Edited to Add: It is worth noting that Morgan Park lost population in all racial categories. White numbers dropped by 8.1 percent. Black numbers dropped by 7.75 percent. Even Hispanics, whose presence was negligible, lost 7.3 percent of the population. Those population declines are striking. The trends well established and it will have a big impact on Chicago. Will Raja Krishnamoorthi step aside for Tammy Duckworth? Just wondering if Krishnamoorthi will step aside (and what he would need to go) to allow a Duckworth a free shot at the nomination, and bank all that money for the General against Walsh. It is time for Raja Krishnamoorthi to answer some tough questions about his management and oversight of Illinois’ Bright Start program. Raja claims credit for supervising the Bright Start program, but who was actually watching the investments? Raja claims Bright Start program is one of top College Savings programs, yet all but one of Illinois funds lost 50 – to- 400% more than their benchmarks? Who’s going to compensate the 185,000 Bright Start families for the rest of the 40% of their tuition money lost in Oppenheimer’s derivative swaps trading in its Core Bond and Fixed Income funds? Raja welcomed parents into the program and promptly switched the plan sponsor – his choice, Oppenheimer. Raja left when most of the funds cratered, performing vastly worse than their benchmarks. Instead of staying with the office to fix what he broke, Raja left, to run for the next political office. Raja has turned into the typical Illinois politician: Ducking responsibility for mistakes made, and leaving Illinoisans to pick up the pieces. We don’t need a new generation of the same old talk. As the Daily Herald said, we need more than just talk. I’m guessing K goes, but it’s going to take a price because the Indian Community may well see it an affront. Elite media just refuses to make the obvious links. Get of the high horse Bob. Please… prison should have cut you down to size a bit, or are we all supposed to forget that time served? H/T loyal reader anon for pointing me to this story in American Thinker on the Frawley saga. Frawley’s sentencing by the way has been postponed… again. Later in the deposition, Weaver's lawyer, Daniel F. Konicek, asks Frawley about what specific information Weaver is supposed to have told Frawley to withhold from federal authorities. 'I'm assuming the information is about the payments made by Rezko to Obama, so we know we're talking about the right conversation, right?' Konicek asks Frawley. Nobody directly involved with the deposition -- including Frawley and his lawyers, Weaver and his lawyers, and the FBI and U.S. attorney's office -- would comment. Alsammarae’s back from Jordan too; making noise in front of the White House. Chicago aldermen have no money for libraries but millions for ward map fight: Another day, another alderman squabbling over the ward map. Check out the map and the new First Ward. Ghost of John Brown's take on the Paul Newsletters. Once your name's out there, and the subscriptions pocketed, it's kinda hard to weasel out of some of this Doc. Remarkable, the President of the United States goes toe-to-toe with a back bencher from Illinois over whether the FICA tax holiday should go on for two, or twelve months. Despite the Republican caucus’s unanimity, the Obama Administration singled out two congressmen for blame: Rep. Allen West of Florida, and Illinois’s own Joe Walsh. White House spokesman Dan Pfeiffer blamed West, Walsh and other Tea Partiers for undermining an agreement House Speaker John Boehner had struck with Senate Minority Leader Mitch McConnell. The payroll tax cut extension passed the Senate, 89-10. In an interview with the conservative website Newsmax, Walsh said he voted against the bill because a two-month extension is “not workable” for businesses. House Republicans want a year-long extension. That video of Walsh telling "President Obama, quit lying." must have really stung! It did by the way, shut Obama down, and nary a word was further heard from him on suspension of SSA checks. Forget Duckworth and Krishnamoorthi, Obama's getting in the ring with Walsh. That's gotta be dumb presidential politics shining the spotlight on the humdrum burbs Northwest of Chicago. Great story for us bloggers... and Walsh. The busy life of a Congressman. Last I recall, Congress had a barbershop. Davis (D-Chicago) is running for re-election to Congress and also to be Chicago’s 29th Ward Democratic committeeman. But before he can get on the March 20th ballot, Davis must clear up about $1,887 in fines owed to the Illinois State Election Board, according to WBEZ reporter Sam Hudzik. The fines, imposed on two of his committees – Citizens for Davis and Davis for Mayor – were levied because campaign money disclosure reports were filed late or not at all. Davis knew about them, but explained in an interview last week with WBEZ that the congressional schedule has kept him too busy. “I’m here [in Chicago] for two days, and – damn – I can’t find time to go get a haircut,” Davis told WBEZ. ...the path for Walsh clears. I understand the need to make a place attractive to business, but this one strikes me as bad, in a bad economy, with people strapped. I have no idea who Bystronic is or whose crony they may be, but it’s the start of a crony capitalist arrangement I bet. City Management Analyst Aaron Cosentino said Monday the jobs incentives package originally was put together when the prior council was seated but did not come up for approval until after the spring municipal elections. The new council wanted an analysis of the economic benefits of the incentives package compared with its costs to the city. The cost of the Bystronic package totaled as much as $167,000. That includes as much as $85,000 in bonuses the city would pay the company for each employee it hires. The company would be required to maintain for the first five years at least 25 jobs with annual salaries of at least $40,000. But the city would pay incentives to entice Bystronic to grow its workforce. During the first five years of the agreement, Bystronic would receive $2,000 for each job created with an annual salary, before benefits, exceeding $40,000 and $3,000 for each of the initial 25 jobs created with an annual salary exceeding $70,000. After that, the benefit is cut to $1,000 per job paying at least $40,000 before benefits. Under the agreement, Bystronic is supposed to recruit and hire Elgin residents. That part of the agreement is capped at $85,000. The second part of the agreement would reimburse Bystronic $81,843 for impact and other fees associated with its new facilities in Elgin and would give the company two annual memberships to Bowes Creek Country Club for three years. They don't call us windy in Chicago for nothing. The Prez shooting the breeze here. Gary Johnson goes it alone as Libertarian. My post from Johnson's visit to Chicago and America's Future Foundation. A bipartisan bill that deserved more coverage in the press….. The purpose of today’s meeting is to mark up the Expedited Line-Item Veto and Rescissions Act of 2011. I am proud to be here today marking up legislation that was written in a bipartisan way with my counterpart on this committee, the Ranking Member, Chris Van Hollen. Chris, I want to thank you and your hardworking staff for helping us advance this common-sense reform to improve government’s stewardship of taxpayer dollars. The Expedited Line-Item Veto and Rescissions Act gives the President an important tool to target unjustified spending, while also protecting Congress’s constitutional authority to make spending decisions. This new authority would allow the President to specify spending provisions within an appropriations bill, while requiring stand-alone consideration of these rescission proposals by Congress. Legislation implementing the proposed spending cancellations would receive expedited floor consideration and an automatic up-or-down vote in both chambers of Congress. Should Congress approve the rescission bill, every dollar of savings would be devoted to deficit reduction. In addition to this bill, there are a number of other budget process reforms that are badly needed and that I want to mark up in this committee. This bill, for example, does not address mandatory spending, which represents 60 percent of our budget and is the key driver of our debt. We also need to keep in mind that budget process reforms alone will not solve our enormous budget challenges, but this reform and others can give us tools to help us tackle the drivers of the debt and remove impediments to economic growth. With that, I yield to the Ranking Member, Mr. Van Hollen. “The House Republican Conference met this evening to talk about our way forward. Listen, our Members believe that we passed a reasonable responsible bill that would extend the payroll tax credit for a year. It would take care of those doctors who treat Medicare patients – the reduction in their payments – solve that problem for the next two years. And extend unemployment benefits with reforms for a year. Exactly what the president asked us to do. “Our members do not want to just punt and do a two-month short-term fix where we have to come back and do this again. We’re here. We’re willing to work. We will appoint conferees and we hope the Senate will appoint conferees because we’re willing to get the work done now and do it the right way. The income tax killing our jobs and economy. Ton Cross at IR above. This one will get plenty violent. Christopher Hitchens and Newt Gingrich: What kind of war are we fighting? Good for Boehner... a big reason for the economy's slow recover is the uncertainity caused by government. A deal for two months doesn't help. Mike, tell me it ain't so. No idea what this one's about. I had to read the General Theory for Macro Economics at Grinnell in 1974. I wonder how many students still have to read it? Samuelson at the above link on how the world's vastly changed in size and velocity since Keyne's time. Change they have: since 1935 and 1974. "Are we moving Medicare from a command and control government run system to a market based patient centered system? The answer's clearly yes," Ryan said. "We're taking Medicare from a public-only option to a real-private option and a market-based option in a market-based system." Wyden-Ryan would transform Medicare from a single-payer system into a system in which those entering Medicare after 2022 receive a capped subsidy, or premium support, to purchase health insurance on an exchange. "It runs the money through the person rather than through the government. The marketplace, the patients and the doctors, can make a decision," he said. Ryan-Wyden maintains the exact same "risk adjustment" and means-testing provisions that the GOP budget did (i.e. the sick and poor get a larger subsidy, the healthy and wealthy get a smaller one). Labour and Management unite on the curse holding back Illinois. Tax appeals and zoning: it's where all the nasty stuff in Cook County Politics happens. Fran Eaton above in the South Town on it. Blagojevich's a fitness nut. Zagel's giving him the rehab program to shave a year off the sentence just mocks the sentence. Maliki, said Iraq's former Minister Ayham Alsamrayy, really does not represent the Iraqi people. He represents the Iranian mullahs. Meetings with Kennedy. Meetings with State. Outside protesting while Maliki's talking with Obama. Poor Rod on his way to the cooler and all sorts of things start popping again. 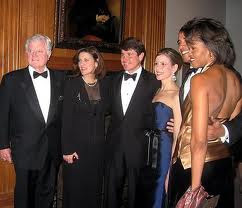 Picture below of Alsammarae, Nadhmi Auchi, and Rod Blagojevich at that Four Seasons dinner where Obama allegedly dropped in briefly. Alsammarae's to Rod's left and partially hidden. Only in Chicago can a story like this happen! Update: video of the demo here including Alsammarae speaking along with Tom Ridge, Louis Freeh, and Patrick Kennedy. Update: Some background on camp Ashraf to help explain what this demo was all about. I'm just curious to see a Chicagoan here participating! 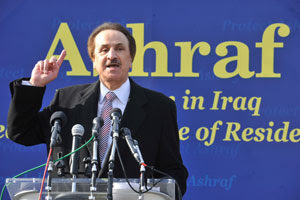 Footnote: Alsammarae on radio Sawa June 2008 supporting the insurgency in Iraq. What were Ridge and Freeh thinking? Via his Facebook page. Raja's getting the local endorsements while the national players go for Duckworth. International Brotherhood of Electrical Workers (IBEW) Local 134 today endorsed Raja Krishnamoorthi’s candidacy for Illinoi’s 8th Congressional District. IBEW Local 134 is one of the most powerful local unions in the Chicago-land area and Illinois with 14,254 members. Krishnamoorthi’s role as president of a small business and a family man puts him on the front lines of this economic crisis every day and puts him in a unique position to understand what working families and small businesses are going through. Democrats bring cash in wheel barrels for Duckworth. Pelosi and Boehner bring the rumble to Illinois’s 8th. Everyone things Duckworth’s going to get the nomination without much of a fight. I think Raja’s going to prove that wrong. Rice was hired last month as a $84,420-a-year deputy director of traffic safety for the Illinois Department of Transportation. The spot on the payroll is exempt from civil service rules, meaning that the Quinn administration was free to fill the post based on political considerations. The Machine taking care of its own. Chicago aldermen get paid $114,000 a year, but a FOX Chicago News investigation finds two of them are paying themselves out of their campaign funds for extra work, like marching in parades, passing petitions, and slating candidates at political meetings. Ald. Danny Solis (25th Ward) has paid himself $194,778 since 2004. "My job is to promote the Democratic Party in the 25th Ward, and that's what I paid myself for," Solis said. "If I paid a consultant, they would probably get paid maybe a little more than that if they were doing this full-time." It's the good people of the 36th and 25th Wards getting stiffed here. Who Needs Democrats When Illinois Republicans Will Attack Each Other? From over at Prairie State Review on the primary in the 52nd State Senate District. Who Needs Democrats When Illinois Republicans Will Attack Each Other? Gotta wonder what a party’s for when stuff like this happens. In this engrossing new history, published upon the war's bicentennial, Gillum Ferguson underlines the crucial importance of the War of 1812 in the development of Illinois as a state. The history of Illinois in the War of 1812 has never before been told with so much attention to the personalities who fought it, the events that defined it, and its lasting consequences. Endorsed by the Illinois Society of the War of 1812 and the Illinois War of 1812 Bicentennial Commission. I never knew there was an Illinois Society of the War of 1812 or a Bicentennial Commission on it! Anyways, my kind of book, about a chunk of little known history. Illinois was an awfully violent place, even then, and for will before then too. By passing Dekalb and the Northern Illinois University seems a mistake to me. But there's a whole lot more freight on the UP's mainline to contend with than on the old Rock Island and CB&Q lines they're proposing to use. Still, without a University town on the line, I don't see the patronage here. Naperville to Genesso, who is going to make that trip? A bit of a stretch putting Blagojevich away for 14 years while Speaker Madigan carries on the ways. IR quoting the IL GOP on Madigan's watering down Pension reform to satisfy buddies. And that's the mild stuff Madigan up too. What about someone looking into the Madigan/Berrios nexus on property tax appeals. That was the bread and butter business. Some video from today's Hultgren Campaign Open House in St Charles Laura Wallet, Rep Bob Pritchared, and Daniel Sidmore. Laura Wallett gives a nice stump speech in the second video. More on her at Illinois Review. No big news at this event. Everyone just happy the race's taken the turn it has. A pic of me and Randy. I'm not photogenic enough for office. A couple of clips from Crain's Retooling Chicago series The second on Austin's PolyTech mentions the stats on Chicago's skilled labor shortage. Go occupy that. It's the 8th! It'll be a great race whether Duckwork or Krishnamoorthi. Update: Warner Todd Huston was there and talked with Joe, plus his take on the evening here. Bill Kristol's still talking a Ryan Rubio ticket and explains how it could happen. The two are my druthers too. Hope. A hearing with Don would've been grand. Bacus should have called him. ...in fact, Democrats did not even hold a confirmation hearing for him, which would have allowed him to confront and (potentially) persuade his Republican critics. Instead, it was Democrats' tactical (read political) decision not to hold a confirmation hearing for Dr. Berwick, since the American people might have found his many past statements in favor of rationing or his praise for the British NHS health system (which actively rations access to, among other things, new cancer drugs) deeply problematic in the run up to the November 2010 elections. In fact, that record might have made it very difficult for Senate Democrats in swing states to vote for him - creating a bipartisan vote against his confirmation and a huge embarassment for the Obama Administration. In other words, revisionist history notwithstanding, Democrats found it inconvenient to actually schedule a hearing and vote for the man who they now say is indispensable for Medicare reform. I can assure readers, a confirmation hearing for Don would have been a grand Turkey shoot. A catastrophe for Obamacare. The consultant to NHS, who schmoozed NHS for contracts, then behind the doors told NHS all its problems, would have been the best evidence of the pathology of the Medical Industrial Complex. As a result of disclosure, transparency, and ethics enforcement reforms, the Better Government Association lifted Louisiana from 46th to 5th on its Integrity Index. The Center for Public Integrity places the state 1st in its ranking of legislative disclosure requirements. Ethics reform plays a significant part in Louisiana’s improved business climate. In 2009, the Gallup Job Creation Index ranked the state number three in the country. In 2010, Site Selection magazine rated its business climate number one in the nation. There’s no dispute that Louisiana’s economy is vastly better than it was. A great story to be compared to the sorry narrative in Illinois and Gov Quinn. Go read the whole thing. What's with Illinois we can't produce a few of our own Bobby Jindls? Quinn on Blagojevich above. What rock was Quinn under since 2002? 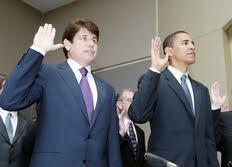 Fitz repeated again yesterday Blagojevich ran a criminal enterprize for the moment he entered office in 2002. Quinn a good team player right through the re election. Either awfully stupid or lying through his teeth here. More fish in the barrel for the Feds to net. Federal authorities have begun a criminal investigation into how nearly a dozen union officials became eligible for inflated city pensions, according to subpoenas obtained by the Tribune and WGN-TV through an open-records request. The Chicago municipal employees and laborers pension funds each received subpoenas from a federal grand jury in October seeking "records pursuant to an official criminal investigation." The request seeks documentation on 11 labor leaders who appeared in reports from a joint Tribune/WGN-TV investigation. He's racking up the endorsements IR has the list at the link above. Fran Eaton recalls a tweet from Blagojevich. We deserved better from Judge Zagel and Fitzgerald; we deserve the truth. 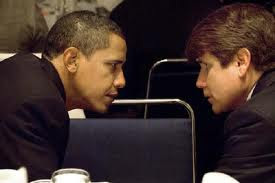 In sentencing papers, the government contended that “Blagojevich’s criminal activity was serious, extended, and extremely damaging.” The crimes proven at trial were not isolated incidents, but, instead, were part of an approach to public office that Blagojevich adopted from the moment he became governor after he was first elected in 2002 on the heels of gubernatorial corruption and running on a campaign to end “pay-to-play” politics. If the story's been ongoing since 2002, there is plenty left untold. For such high minded comments from Fitzgerald, he's walking away from the rest of the sordid tale. You bet Illinosians have had the fabric of our political lives torn apart. Burying the scraps no way to stitch things back together. We deserved better from Zagel and Fitzgerald then just putting the guy who knows so much into a cooler for 14 years, and 600 hours of tapes sealed; never to be heard. Jackson Jr walks unscathed. Only the facts from the last act told and a big void from 2002 till then. The evolving scandal over “green jobs” — with huge loans handed out to faithful campaign contributors — epitomizes the special dealing that has become an art form in the system of Chicago and Illinois politics. Beneficiaries include longtime Obama backers such as Goldman Sachs , Morgan Stanley and Google. Another scandal is building up around the telecom company LightSquared. This company, financed largely by key Obama donors, appears to have gained a leg up for a huge Pentagon contract due to White House pressure. But the bare demographic and economic facts for both Chicago and Illinois reveal a stunning legacy of failure. Go read the whole thing for the sad sorry statistics on what we've done to Illinois. Back in the 70s, I had a friend who had been in SDS with Ayers and Dohrn. He told me they were two of the kindest and gentlest people he had ever known (consider we were both in our early twenties). As I look back I realize my friend was describing cult leaders. People who seduce others into situations they otherwise wouldn't consider. In the case of my friend, arrest and expulsion from school lead him to Grinnell, rather than the Weathermen. A near miss with a violent cult. Anyways, the pair's still seducing away at our expense per above link at Illinois Review. Update: more over at Rebel Pundit How long must Illinois taxpayers keep subsidizing this crowd? Update: Prairie State Reporter's take. "I did not run for Congress to become part of Washington, I went to Washington to change the way Washington worked"
McHenry - Congressman Joe Walsh will make an important re-election announcement this Thursday at the Chicago Tea Party meeting. After spending the last week discussing his options with family, supporters, and party officials, Congressman Walsh believes the choice is clear. Walsh stated "During my first year in office I upheld my campaign promise to do everything I could to rein in the mistakes that were made by the Obama Administration. From voting to repeal Obamacare, cutting spending, cutting taxes, and cutting the size of government, I have made it my mission to stop and roll back the damage that President Obama and Nancy Pelosi created. At the same time, I have also challenged my own party leadership when I think they did not go far enough. It is for that reason that I was one of only 22 Republicans who opposed the compromise that created the failed Super Committee. I did not run for Congress to become part of Washington, I went to Washington to change the way Washington worked. It is why I have pledged to only serve three terms, it is why I turned down my health care and pension, it is why I sleep on my couch, and it is why I come home every single week and have hosted close to one hundred town halls. During those numerous town halls I have heard from Republicans, Democrats, and Independents who feel as if both parties have failed them, and that Washington is out of control. Like me they feel as though their country is being taken away from them, and that it is time to be bold. Whether you call them tea party members or just frustrated, patriotic Americans, this group of individuals is growing. They are fed up and want change now. I can think of no better place to announce important news concerning my re-election than in front of these folks at the Chicago Tea Party meeting. James Fuller has a nice list of the candidates who have filed to run in local and county races. Lots happening in Kane County. It's the doldrums up in McHenry. The link here. Illinois Review: It's 3:20 PM CST Monday, Dec 5th. Do you yet know where Joe Walsh will run? There is worse news still for the Railways department and tens of thousands of passengers who travel on trains from day to day. Eleven further trains departing from the massive Lahore Railway Station, once one of the principal headquarters of rail travel in the country, have been cut. The trains provided services to Peshawar, Shorkot, Narowal, southern Punjab and other parts of the country. This takes the number of trains cut to 131, the highest in history. AfPak's off way too many people's radar screens. Iran too, and I have the feeling it's all going to come crashing in on us in the next few months. Below via Bill Roggio's Long War Journal. According to Dawn, US personnel have begun to vacate Shamsi Air Base in Pakistan's Baluchistan province. Shamsi has been described in the past as a hub for intelligence operations as well as a base for the CIA's unmanned Predator and Reaper drones. The Pakistani government ordered Shamsi closed within 15 days after US forces killed 24 Pakistani troops in a cross-border incident in the Mohmand tribal agency. The new alderman there is Nicholas Sposato, a former firefighter who got the job by beating John Rice in April. Rice had been appointed to the post on the recommendation of his more powerful predecessor, William J.P. Banks, the long-time Democratic ward committeeman. In what surely qualifies as a prime example of the law of unintended consequences, the City Council’s mapmakers have preliminarily decided that the reward for 36th Ward voters who threw off the yoke of the Machine is to take away their ward. The proposed new 36th Ward would abandon three-fourths of its current territory to move eastward in two prongs so that it can become a 67 percent Latino majority ward, filling a need to add another Latino ward on the North Side because of population shifts. You can bet that new Hispanic Alderman's going to be a Machine Alderman first. From the guy Blagojevich hired to tell Illinoisians Mannheim Road at nighttime had nary a mobster. What else has Holders DOJ done that could use some daylight? Newt wins. Don't underestimate the power of that fallen-then-redeemed-preacher archetype. Past wives don't seem to be an issue. I stopped at Manny's for Lunch before heading over to the Veterans Art Museum. Some pics from Chicago's Veterans Art Museum. Update: More Joe here. At Allen Skillcorn's Value Voters Forum including video via The Prairie State Report. Joe doesn't rest. Update 8:33PM Via Kane County Chronicle. Streamwood resident Jim Cook, 77, said he came to see whether Walsh was as much as a rascal as depicted in the media. "But he's not," Cook said. "I found the man interesting. ... He has a lot of good ideas. Except that he is too conservative for my point of view. ... I have not voted for a Republican in all my life." Walsh starts the Town Hall with the Pledge and than recognition of Veterans in the audience. Walsh responds to question about whether he'll run in the 8th. It's a twelve minute answer. If you don't want to wade through the video, just know he'll decide and announce next Monday. But it's twelve minutes of Joe at his finest. Worth watching. One guy in the audience told Walsh he was as far left as Walsh was far right, but he'd still vote for him because he likes what Walsh was saying. There were a few of these occupy types in the audience and Walsh has a knack for engaging them. A must read column by Larry Bell as Judge Zagel gets ready to put Blagojevich and the tapes into a very deep cold storage for decades. We need answers to all of the questions Bell asks here. People know those answers. People in high places. People in Foreign Places . People in Chicago. But not the American public. Footnote: Afterall, Holder's DOJ a pretty slippery outfit. To regain full employment (5 percent, which happens to be the same as the level when the recession began) with the pre-recessionary labor force participation rate, we would need 150.7 million jobs—10.1 million more than we have today. That’s a reasonable measure of the hole we’re still in, two and a half years since the official end of the recession. Full employment is Bush's 5 percent? What Democrats were calling those Bush years fully employed? At least someone's looking. 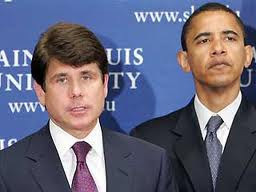 It's really going to rub the wrong way if Blagojevich gets 15 to 20 and Jackson walks free. With the exception of voters with post-graduate degrees, Obama is under water with every educational cohort: 42 percent among those with a high school diploma or less, 41 percent among those with some college, and 41 percent for voters with BAs. McHenry County Blog | Would State Prison Threat Deter Political Corruption? McHenry County Blog Would State Prison Threat Deter Political Corruption? Cal Skinner asks if Blagojevich shouldn't be going to an Illinois State Prison instead of a Federal lockup. More of a deterrent maybe to spend 15 to 20 years with fellow Illinosians. I don't know. My gut is to give the Guv probation. I think too many have gotten away, and I'd rather have Blagojevich doing a show on WLS with his mouth running in overdrive. No idea when this happened. Quite an insult. Taxpayers will apparently fund another potentially costly legal battle between Kane County officials as board members and Sheriff Pat Perez could not reach agreement Wednesday on who must pay for a 2 percent raise recently awarded to sheriff’s department employees and correctional officers. Attention guys: taxpayers pay it all. Sounds to me like Sheriff Perez can't take the heat and ought to get out of the Kitchen. The Executive of an Agency takes the Budget the board sets, and then makes ends meet to complete the mission. Whining doesn't cut it. Going to court on the taxpayers nickle really doesn't cut. Taxpayers rightfully should start whining at the ballot box next year.